Treating your skin with a face mask feels like a relaxing therapy, especially in the summer weather because the skin gets all dull and grimy. Lately, I've been using this peppermint clay mask from the Korean skincare brand Innisfree which has now become very popular in India. The real peppermint mask by Innisfree is a wash off pack loaded with natural ingredients and has a clay-like consistency. Containing refreshing peppermint ingredients for a soothing effect, this super refreshing mask gently cleans the skin leaving it looking soft and supple. Is it not the most irritating weather for our hairs right now? Nothing annoys me more than trying to comb through my frizzy hair strands. It is, well, quite energy draining and mood spoiling, to say the least. But do you want to know the two hydrating heroes that are fighting my hair's frizz and are also pretty much winning at it? 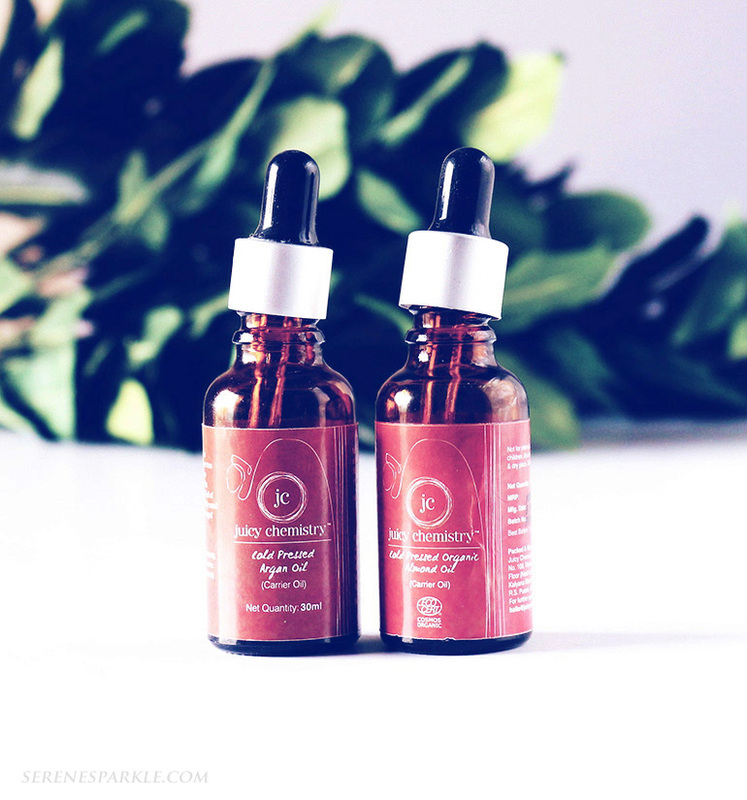 Well, they are the Argan and Almond oil from the natural skincare brand juicy chemistry. Juicy Chemistry Cold Pressed Almond Oil (Rs.350/-): Almond Oil (Prunus Dulcis) is one of the most versatile carrier oils. It is light textured & penetrates the skin easily. It is rich in essential fatty acids, vitamin A, B1, B2, B6 and E. Our sweet almond oil is extracted from the dried kernels of the almond tree in the traditional cold pressed method. We extensively use it in our skin & hair care products, for its ability to deeply nourish the skin & condition dry, damaged hair. Juicy Chemistry Cold Pressed Argan Oil (Rs.580/-): It is derived from the kernels of the Argan tree (Arganiaspinosa). 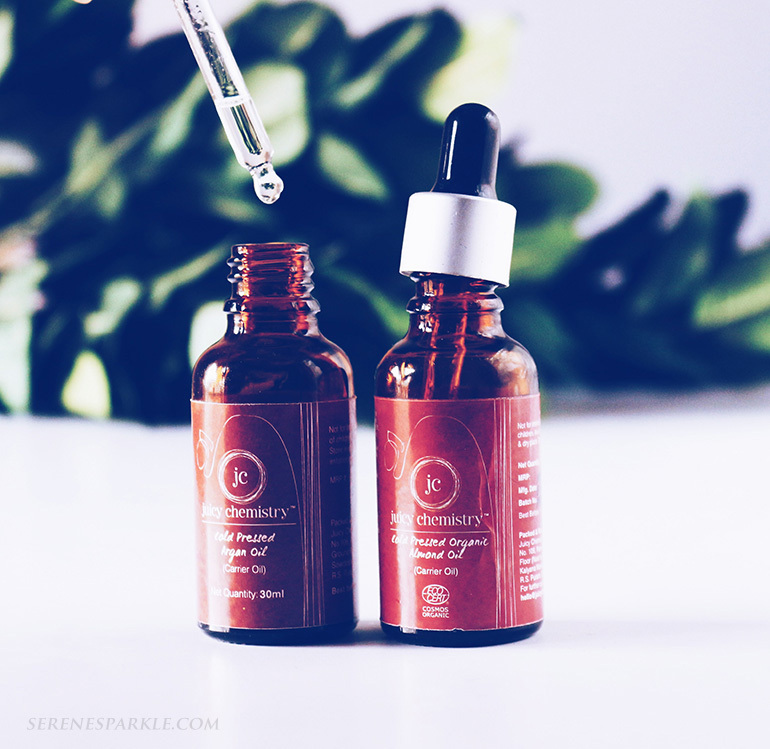 Argan Oil contains natural sources of vitamin E, phenols, carotenes, squalene, & fatty acids. Full of vitamins & antioxidants it is essentially used for hair care because it repairs damaged hair & is deeply moisturising. Today I'll be talking about another very hyped product from the skincare brand Kiehl's. It's their turmeric and cranberry seed energizing radiance face mask. I have expressed in my previous post that their products have been on my wishlist for the longest time. 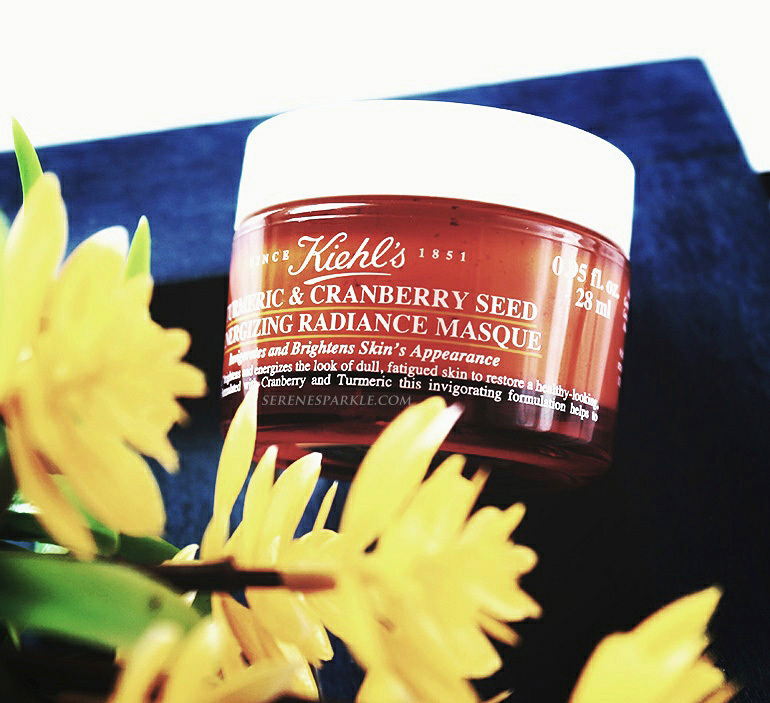 And the product that initially ignited my interest in Kiehl's was this turmeric and cranberry radiance mask. It is quite a popular mask and has garnered a unanimous praise for itself in the beauty blogging world. I have not yet come across a single negative opinion about this mask. In India turmeric is already hailed for its ability to brighten and clear skin, while cranberry, on the other hand, is known to provide anti-aging and moisturizing benefits. Needless to say, I was super excited about trying out this mask. Kiehl's as a skincare brand has always been on my wishlist. I have read and heard amazing things about the quality and the goodness of their skincare products. But their pricing has kept me from buying or trying anything from their amazing skincare collection. However, I did manage to get the Kiehl's butterstick lip treatment on a duty-free bargain and ever since I've been loving this rich and hydrating lip balm.